Updated – 19th November 2016. 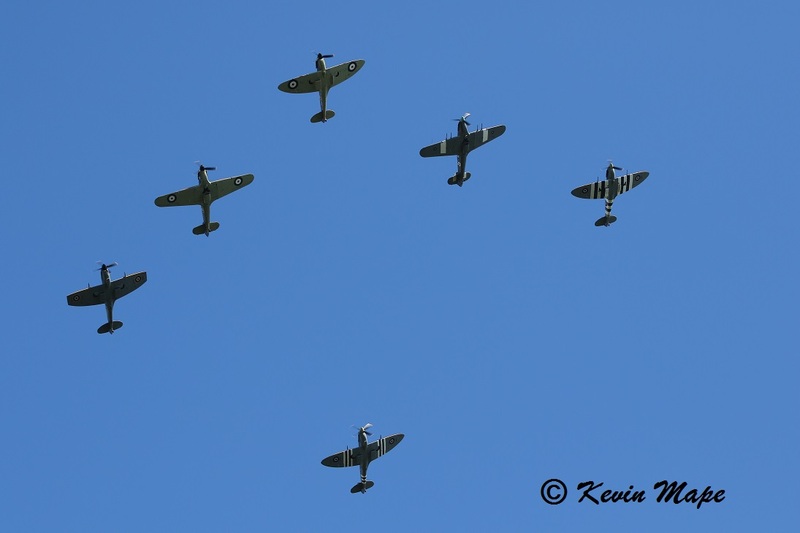 I have put together a list of surviving Spitfire’s from around the World for my own use. All the pictures on this page were taken by myself. 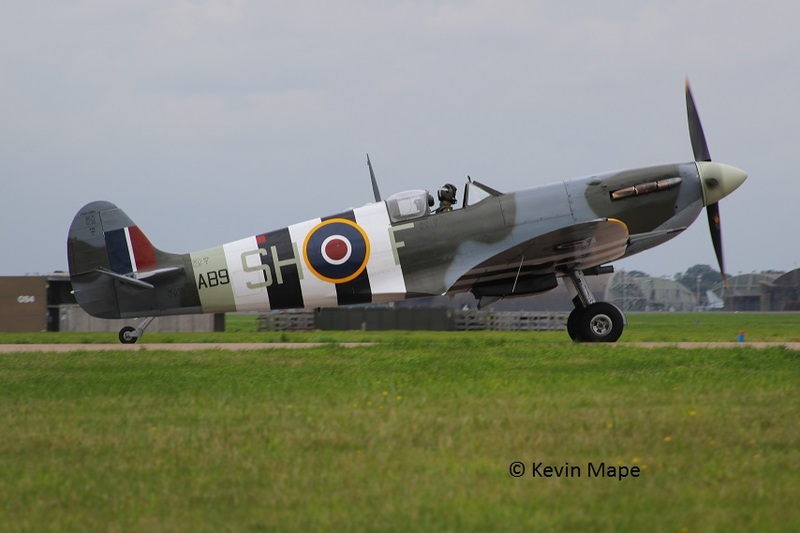 I have listed the Spitfire’s by mark. 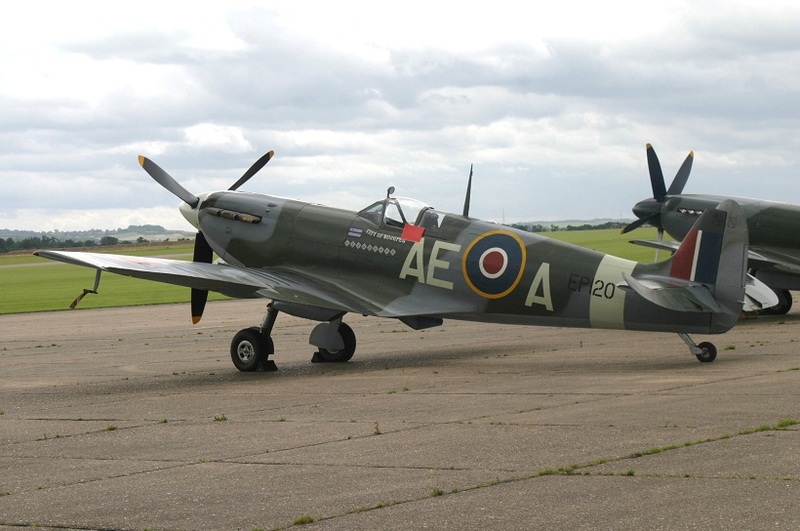 If anyone can add updates or report errors please send me a E-mail with any new info on Spitfire sales, restorations, new markings,First flight after restoration. K9942 : Ia : Wears SD-D : 72Sqn : Displayed at the RAFM Cosford. UK. P9306 : Ia : Displayed at the Museum of Science & industry – Chicago USA. 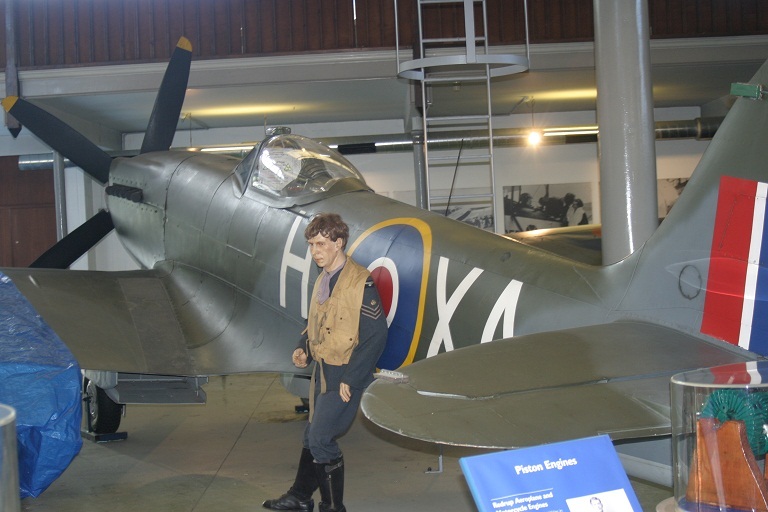 P9444 : Ia : Wears 92Sqn/RN-D : Displayed at the Science Museum London. UK. 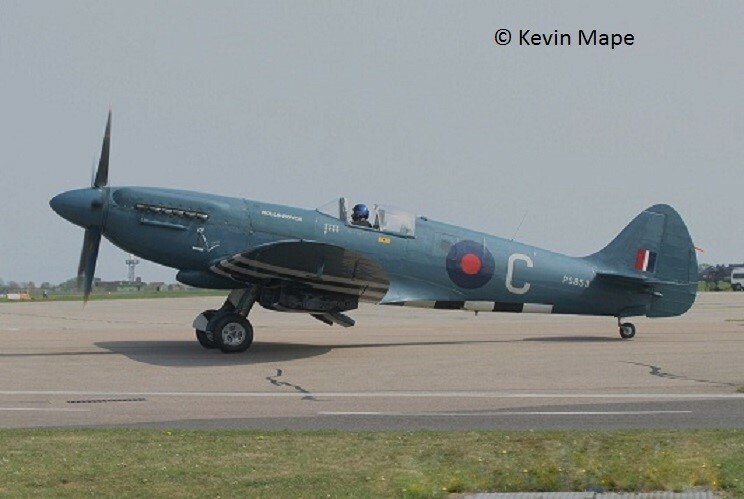 X4276 : Ia : (G-CGUK) AW Wears R6912 /LC for the film “Dunkirk” Based at Duxford UK. 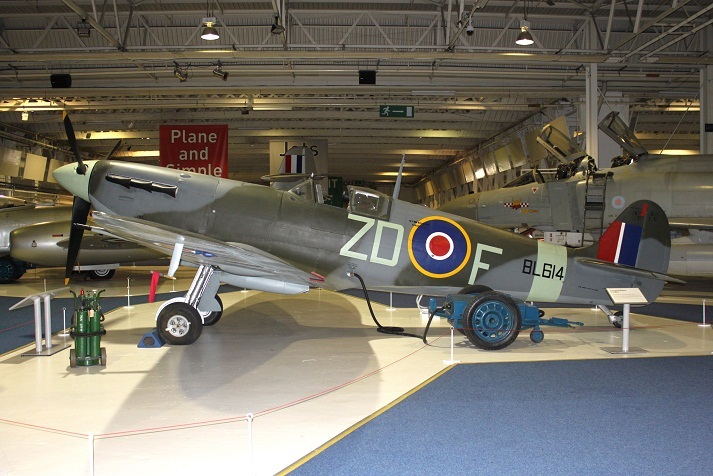 X4590 : Ia : Wears 609Sqn/PR-F : Displayed at the RAF Museum Hendon UK. 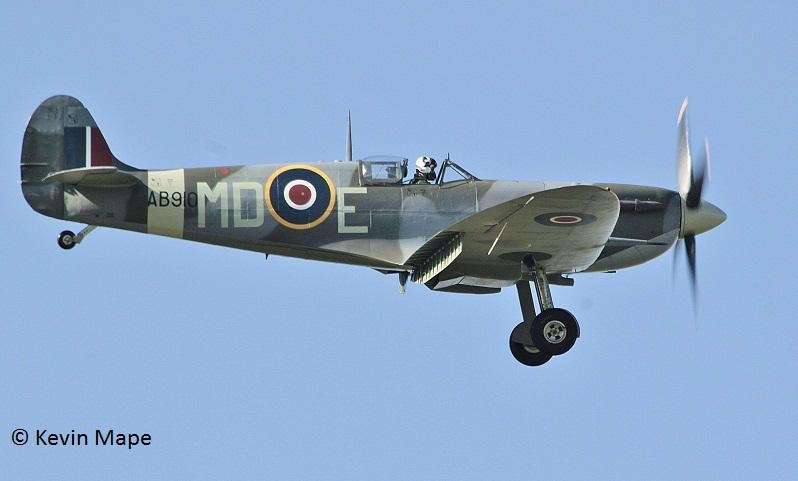 AR213 : Ia:(G-AISU) Wore 57 OTU/JZ-E : Aw Duxford. 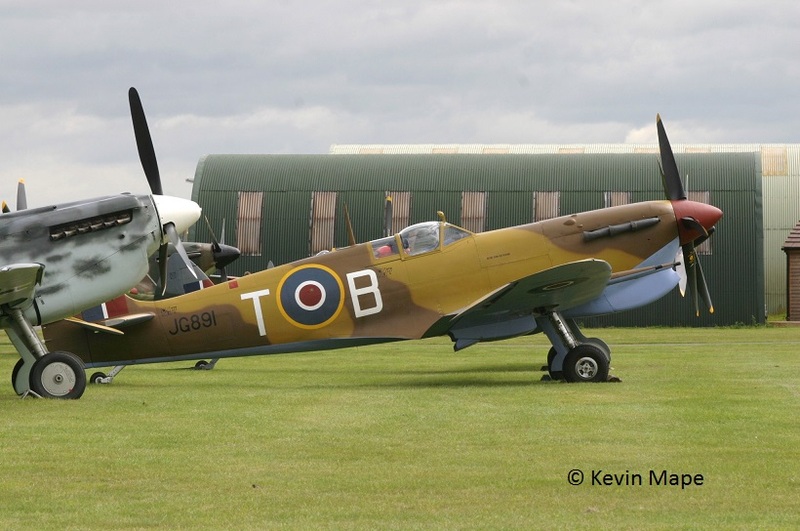 Taken Duxford July 2011. AR213 : Ia : (G-AISU) Wares P7308/71Sqn/XR-D Aw Duxford. UK. P7350 : IIa :(G-AWIJ) : Wore 603Sqn/XT-L : Aw RAF Coningsby June 2006. P7540 : IIa : Wears 312Sqn/DU-W : Displayed at the Dumfries & Galloway Museum UK. P7973 : IIa : Wears C.G.S/R-H : Displayed at the Canberra War Memorial Australia. 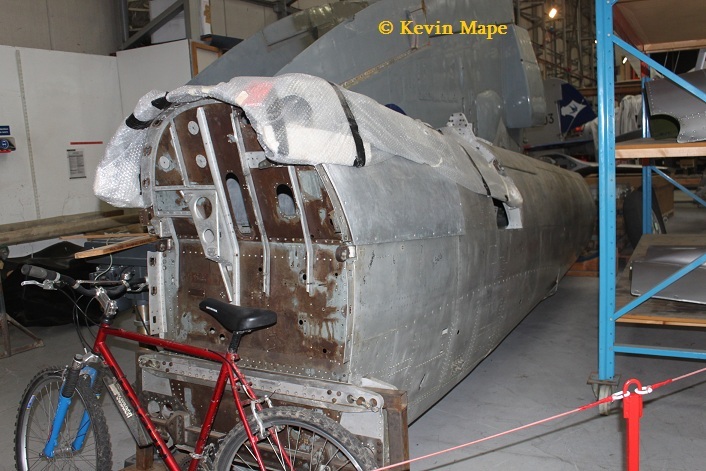 P8088 : IIa : Wears NK-K : Under reconstruction – Picture taken at Brooklands Museum. P8332 : IIb : Wears 222Sqn/ZD-L : Displayed at the Canadian War Museum Ottawa. BP923 : PR IV : Under rebuild to Aw condition. Sollentuna Sweden ex Russia. AB910 : LF Vb :(G-AISU) Wore 303Sqn/RF-D AW : Taken at RAF Coningsby June 2011. AB910 : LF Vb :(G-AISU) Wore 133(Eagle)Sqn/MD-E : Taken RAF Coningsby UK March 2012. AB910 : LF.Vb : (G-AISU) Wears 64Sqn/SH-F : Aw RAF Coningsby UK October 2016. AD540 : Vb : Under restoration to Aw condition at Twyford UK. AR501 : LF. 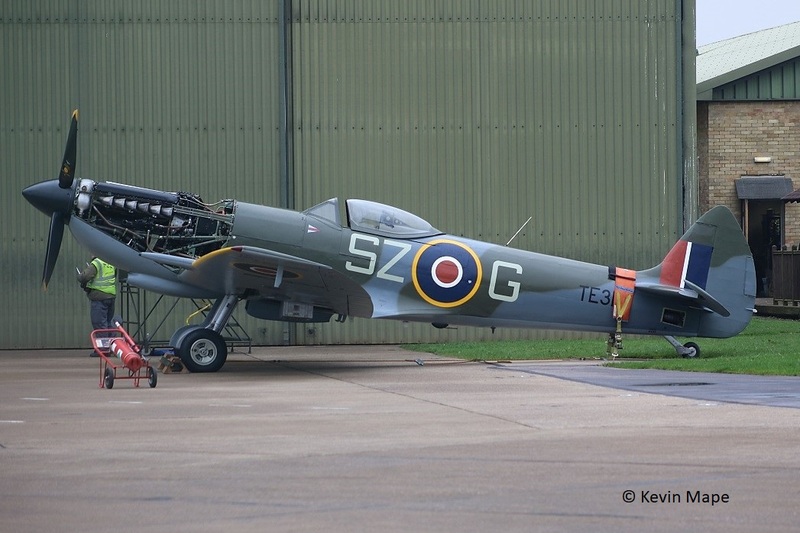 Vc : (G-AWII) Wears 310Sqn/NN-A : Under restoration to Aw condition at Old Warden UK. 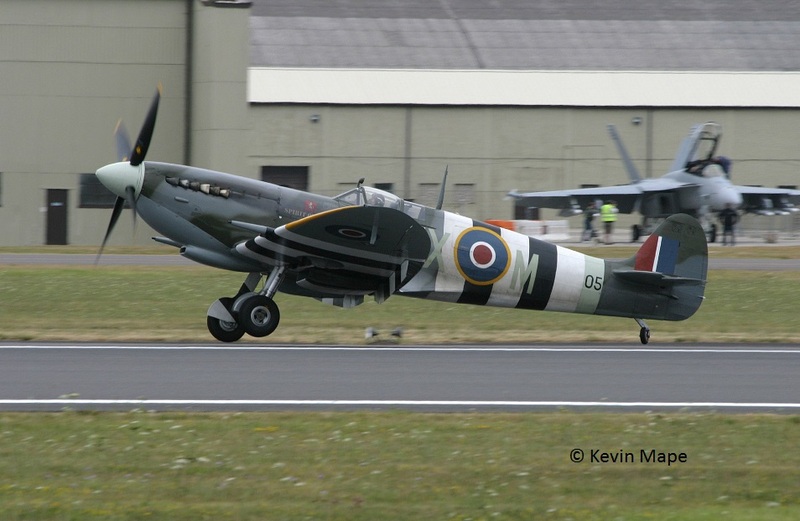 AR614 : LF.Vc : (N614VC) Wears 485Sqn/DU-Z : Aw Flying Heritage Museum – Everett USA . BL370 : LF.Vb :Wears 64Sqn/SH-J : Dispayed at the National WW2 Museum New Orleans USA. 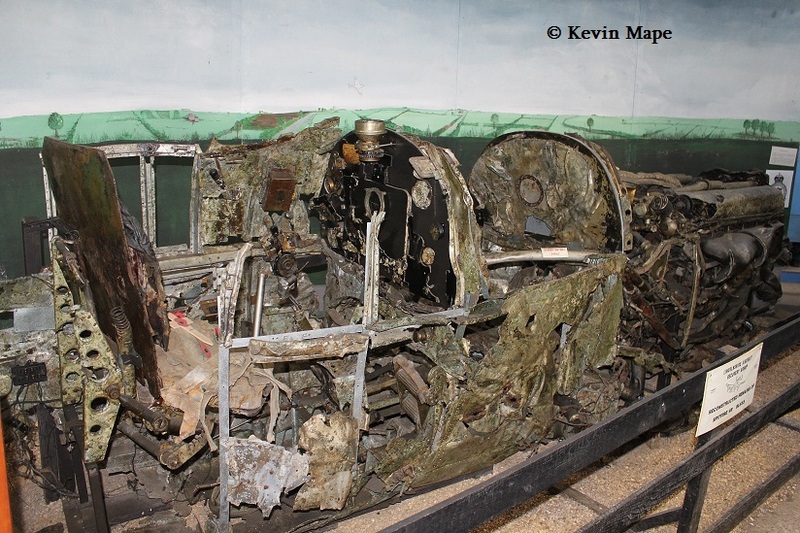 BL423 : Vb : Significant wreckage Displayed at the Broken Wings Museum, Erembodegem Belgium. BL628 : Vb : (N628BL) Wears 401Sqn/YO-D : Aw Jardin Ranch Encinal USA. ex G-BTTN. BL655 : Vb : Remains displayed – Lincolnshire Aviation Heritage Centre East Kirkby UK. BL688 : Vb ; Under restoration in Buckinghamshire. UK. BM597 : Vb : (G-MKVB) Wears 303(Polish)Sqn/JH-C : Aw Duxfoed UK. Taken at RIAT 2010. BR108 :Vc : Nose section Displayed at Malta War Museum Velletta Malta. BR491 :Vc : Remains Displayed at El Alemein Egypt. BR545 : Vc : Remains stored RAAF Museum Point Cook Victoria Australia. BS199 : Vc : (A58-81) Under restoration – Point Cook Victoria Australia. 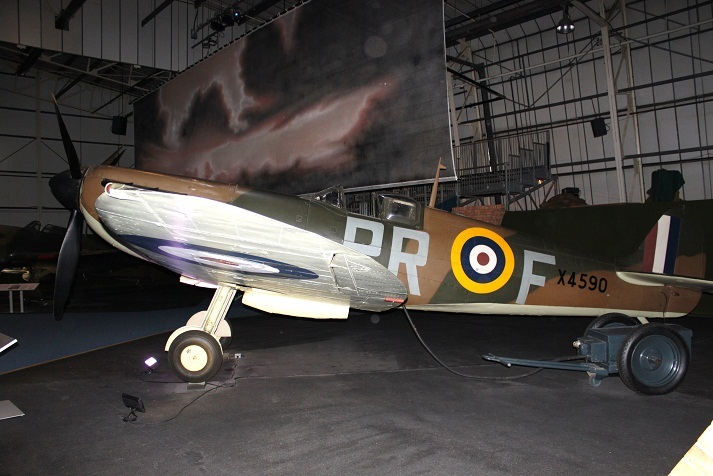 BS231 : Vc : (A58-92) Remains Displayed at Aviation Centre Darwin Australia. 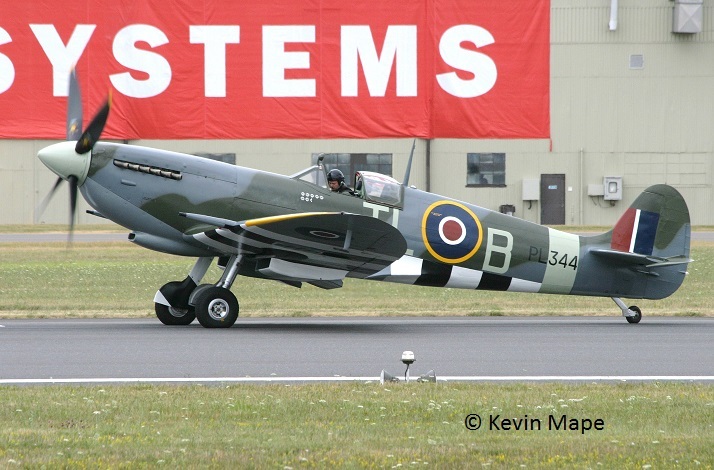 EE602 :Vc : (G-IBSY) Wears 129Sqn/DV-V Aw Biggin Hill Kent UK. EE853 :Vc : A58-146 Displayed at the South Australia Aviation Museum Port Adelaide Australia. 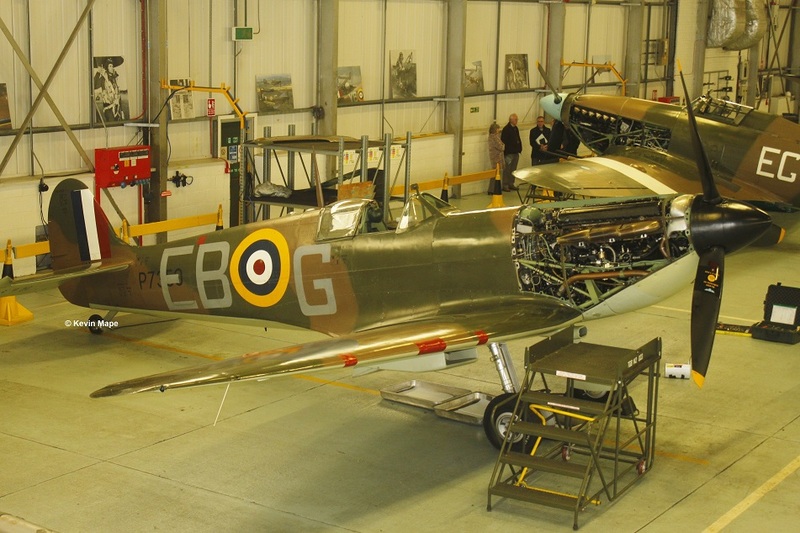 EF545 : Vc : (G-CDGY) Under Restoration Walters Ash East Sussex UK. EP120 :Vb : (G-LFVB) Wears 402Sqn/AE-A : Aw Duxford UK. JG891 : LF Vc : (N5TF) Wears ***Sqn/RS-T Aw Houston USA – Taken at Duxford July 2007 when (G-LFVC) . JK448 : Vc : Wears code B Displayed at the Yugoslavian Aviation Museum, Belgrade, Serbia. 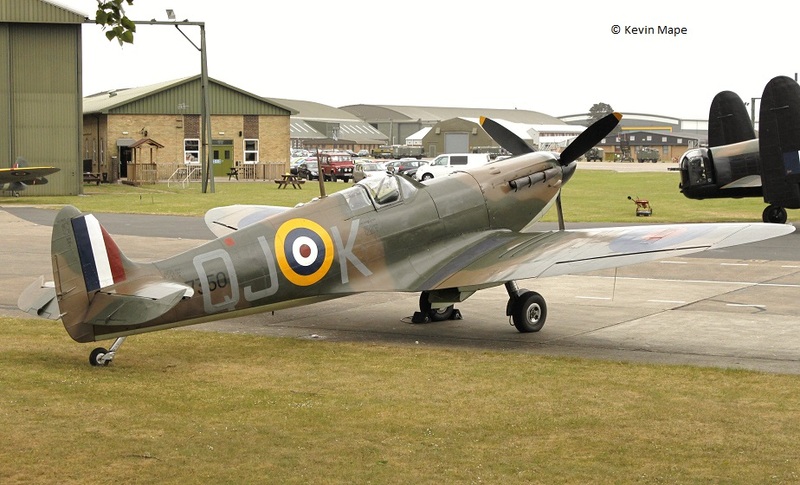 LZ844 : Vc : Wears 222Sqn/UP-X : stored at Kemble UK. MA863 : Vc : Wears USAAF HL-B : Displayed at the USAF Museum Wright Patterson OH USA. EN474 : HF VIIc : Displayed at the Nation Air & Space Museum Washington USA. JG267 : LF VIII : (A58-377) Wreck recovered and stored pending rebuild to static : Bribie Island, Queensland. Australia. JG355 : LF VIII : (A58-359) Wreck remains stored pending restoration project. Melbourne, Australia. JG484 : LF VIII : ( A58-408) Substantial components, restoration project . Ningi, Queensland Australia. JG668 : LF IIIc : (A58-441/G-CFGA) Substantial components, restoration . Haverfordwest UK. MD228 : LF IIIC : (A58-445) : Parts stored pending restoration . Melbourne Australia. 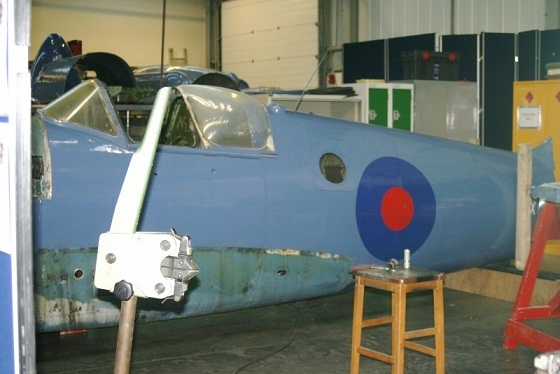 MT818 : Tr 8 : (G-AIDN) Under Restoration Booker UK. MV154 : HF VIIc : (D-FEUR) Wears MT928 145Sqn/ZX-M Aw Bremgarten Germany. MV239 : HF.VIIIc : Aw A58-758 (VH-HET) wears A58-602 / RG-V SE Asia Temora NSW Australia. NH631 : HF IIIc : Displayed in AW condition at the IAF Historic Flight, Palam AB, New Delhi, India. BR601 : F IX : (G-CIYF)Wears 64Sqn/SH-F : Aw Biggin Hill UK . EN145 : F IXe : Wears 20- 78 Israeli Air Force : Display at Israeli Air Force Museum at Hatzerim Isreal. EN199 : LF IXe : Wears R-B named “Mary Rose” : Displayed Malta Ta’Qali Museum Malta. LZ842 : F IX : (G-CGZU) Wears EE-F in Desert camo : under Restoration at Biggin Hill UK. MA298 : LF IX : Wears 41-401 Danish Air Force : at Danmarks Flymuseum, Stauning Airport Denmark. MA793 : HF IXe : Wear JE-J – Displayed at Museu Asas de um Sonho Sao Carlos Brazil. MH350 : LF IXe : Wears 331(Nor)Sqn/LF-T : Displayed at Norwegian Aviation Museum Bodo Norway. MH367 : TR 9 : (ZK-WDZ) Wears desert marks 81Sqn/FL-A : Aw. MH415 : HF IXc : (N415MH). 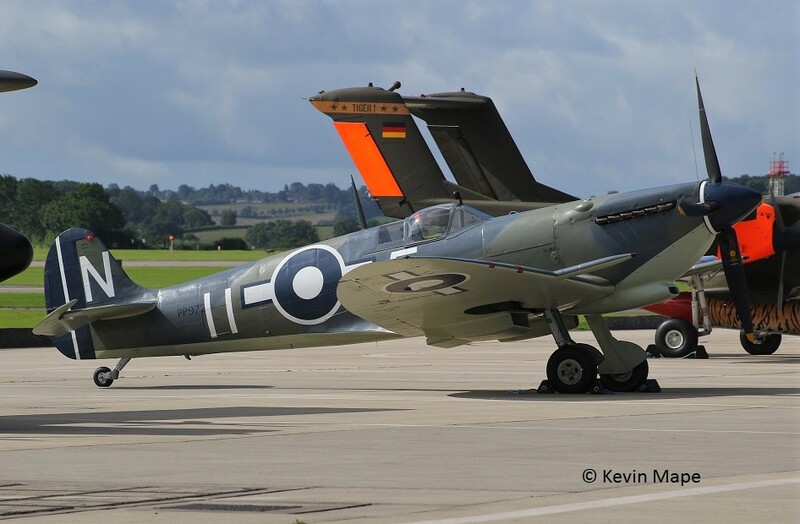 Wears 222(Natel)Sqn/ZD-E Warbirds Flight Club Pty Ltd, Hunter Valley NSW Australia. MH434 : LF IXb :(G-ASJV) . 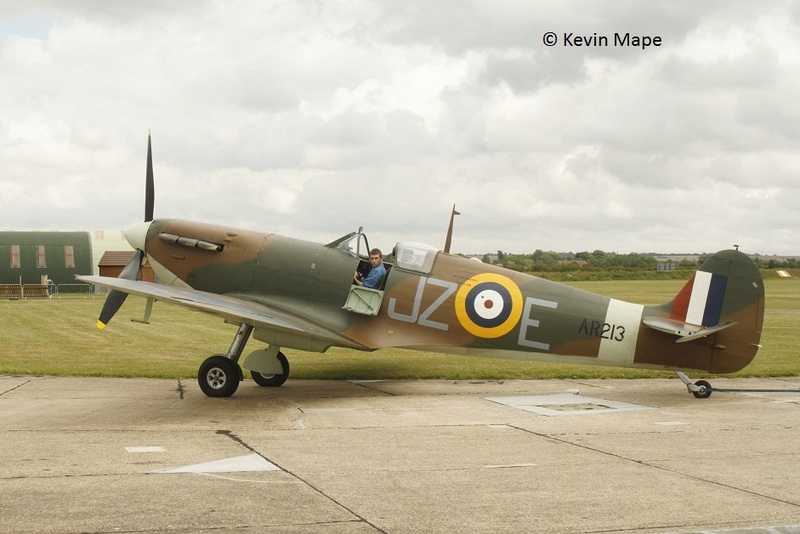 Wears 222(Natel) ZD-B : Aw Duxford UK. MH603 :F Mk.IX : (VH-IXF). Under restoration to airworthy condition at Scone, NSW Australia. 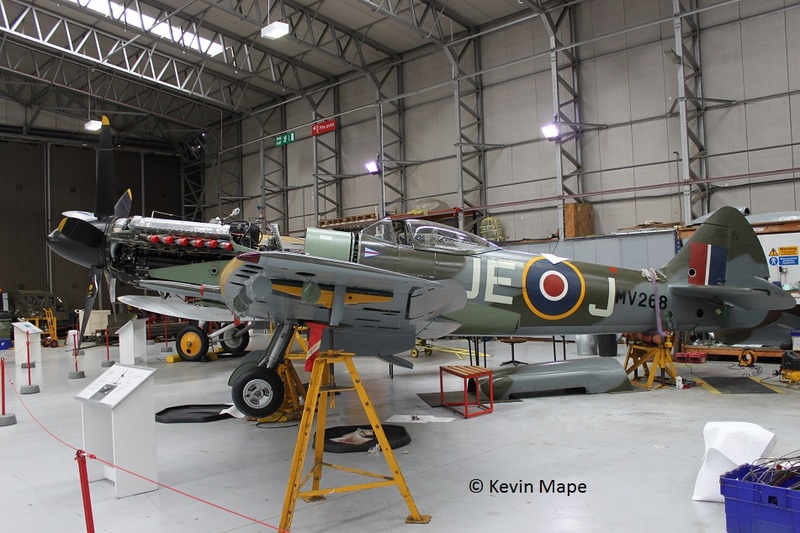 MH750 : LF IXc : Under restoration to Aw condition at Duxford UK. MJ271 : LF IXc : Wears H-53 Royal Netherlands Air Force : Stored Duxford UK. 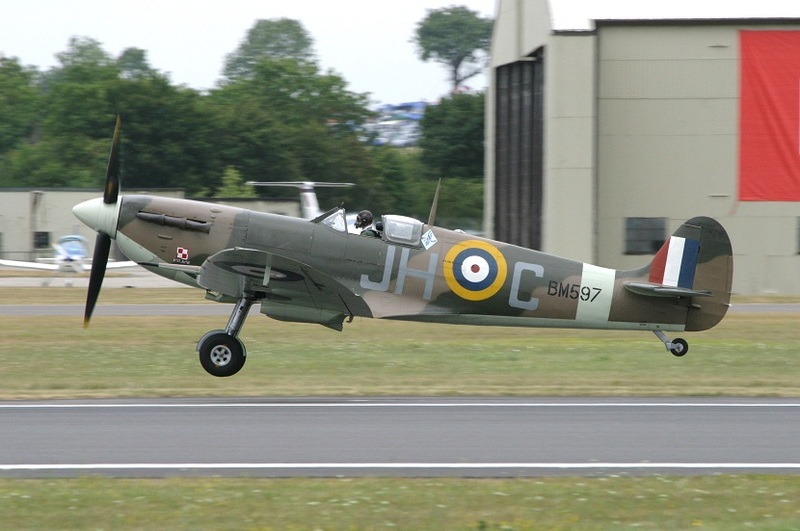 MJ627 : Tr 9 : (G-BMSB) Wears 441Sqn/9G-Q AW Biggin Hill UK . 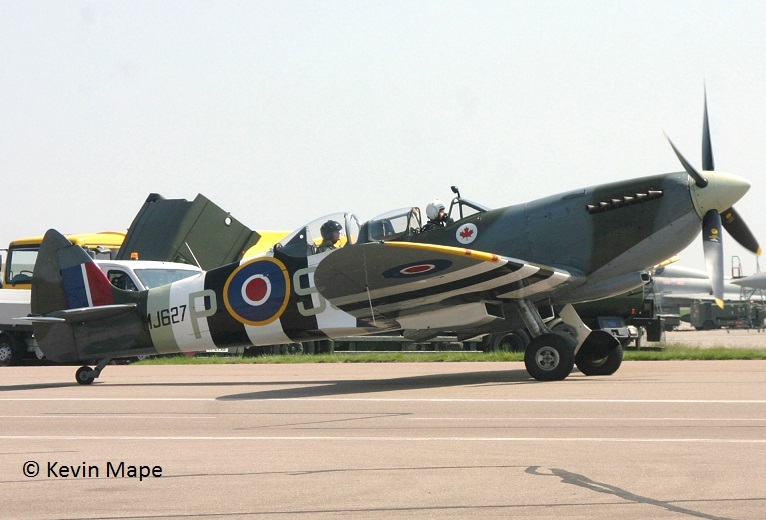 Taken RAF Coningsby coded 9G-P May 2008. MJ730 : LF IXe : (N730MJ) Wears 32Sqn/GZ-? : Aw Military Aviation Museum Virgina Beech Virgina USA. MJ755 : LF IXc : Wears Greek Air Force Marks : Displayed at the Greek Air Force Museum Athens Greece. MJ772 : TR9 : (G-AVAV) Wears NL-R Awaiting rebuild after forced landing. – Germany. MJ783 : LF IXc : SM-15. Displayed at the Brussels Army Museum. It wears MJ630 : 349(Belgium)Sqn/GE-B Mk.IXb . 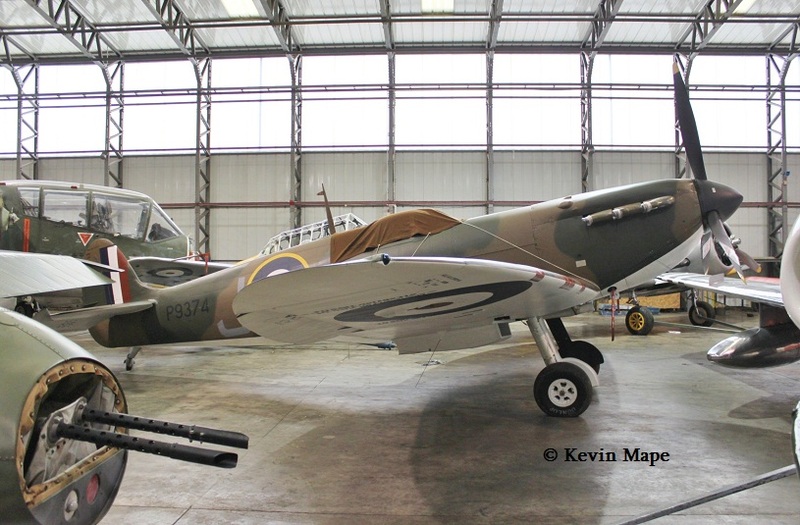 MJ789 : LF IXb : Owned by the Royal Australian Air Force Museum and in storage at Point Cook, Victoria Australia. MJ874 : IXc : Remains displayed at the DAEG Museum, Deelen Netherlands. MK356 : LF IXc : wore 126Sqn/V-21 : Aw RAF Coningsby March 2007. 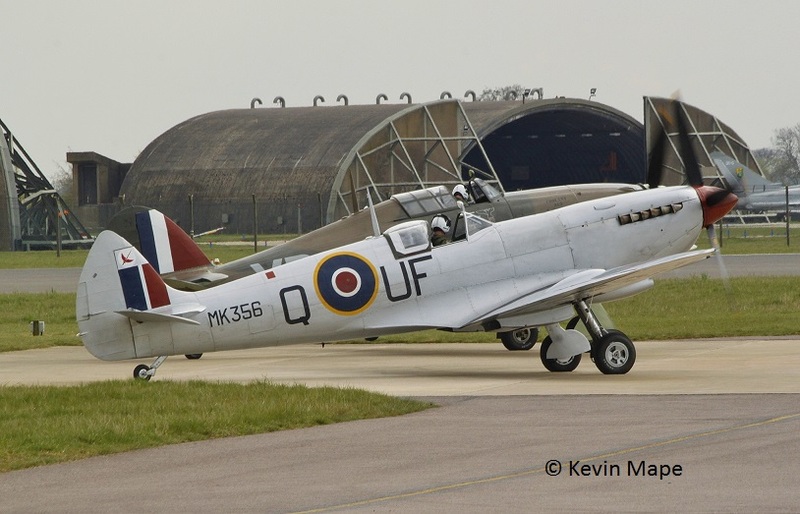 MK356 : LF XIc : wore 601Sqn/UF-Q : Aw Taken at Coningsby April 2012. MK356 : LF IXc : wears 126Sqn/5J-K : Aw RAF Coningsby March 2016. MK356 : LF IXc : wears 92Sqn/QJ-3 : Aw RAF Coningsby April 2018. MK732 : LF IXc : (PH-OUQ) Wears 3W-17 Royal Netherlans Air Force . Aw Gilze Rijen, Netherlands. 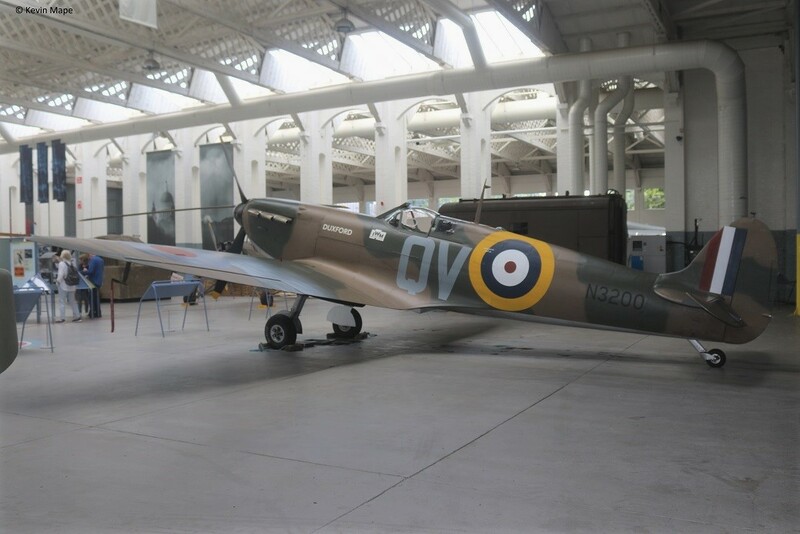 MK805 : F IX : Wears MM4084 : Displayed at the Italian Air Force Museum – Bracciano, Rome, Italy. MK923 : LF IXc : Wears 126Sqn/5J-Z : Displayed Museum of Flight Seattle USA. MK959 : LF IXc : (N959RT) Aw wears 329(French)Sqn/5A-K : Millville, NJ, USA. MK997 : LF IXe : Partial wreckage to be displayed in the Wings over Norway Museum. Oslo Norway. ML119 : LF IXe : (G-SDNI) Wears UB441 Burmese Air Force – Stored In Buckinghamshire. UK. ML196 : LF IXe : Awaiting Restoration at South African Air Force Museum AFB Swartkop SAAF 5518. ML255 : HF IXe : Displayed as FAP ML255/MR-Z : Museum Sintra Portugal. 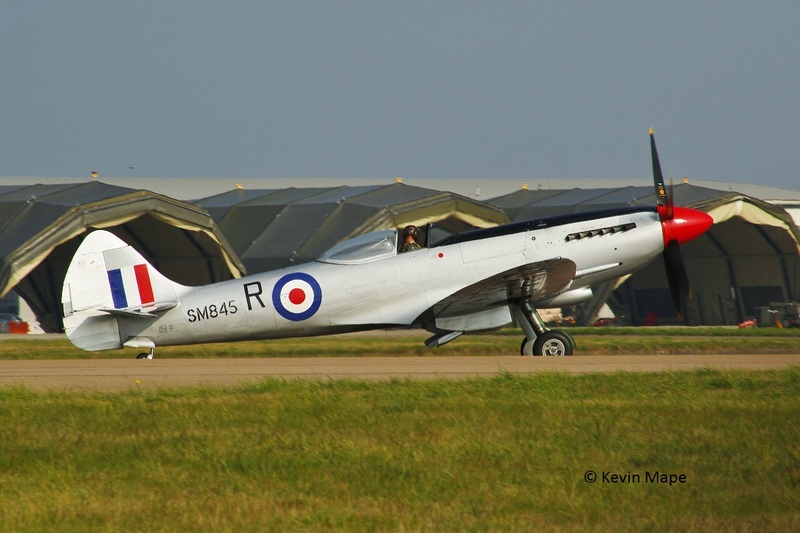 ML407 : :TR 9 : (G-LFIX) Wears : 485Sqn/OU-V : Aw Sywell UK. 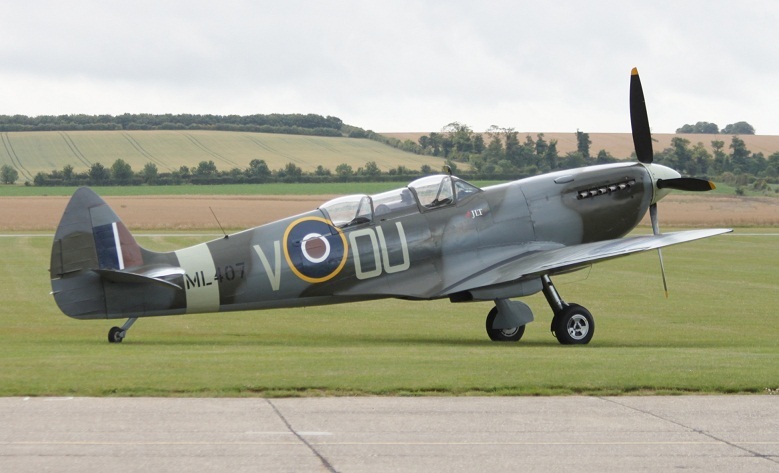 – Taken Duxford July 2011. ML427 : LF IXc : Wears ***Sqn/HK-A : Displayed at the Thinktank Science Museum Birmingham UK. NH188 : LF IXc : Wears 421Sqn/AU-H : Displayed at the Canada Air and Space Museum at Rockcliffe Ont Canada. NH238 : LF IX : (G-MKIX) wears D-A : Stored at Greenham Common UK. 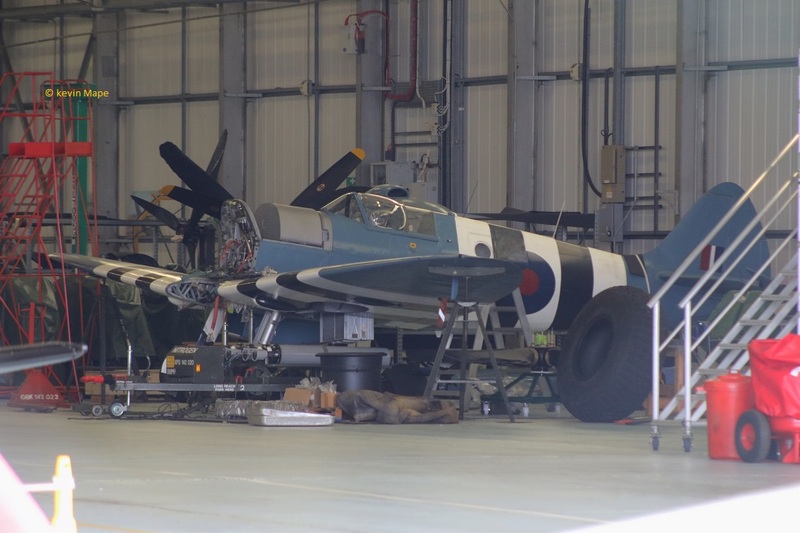 NH341 : IXb : Wears ML295 – Under restoration Duxford. UK. NH417 : HF IXc : Displayed as RDAF 41-401 at the Danmarks Flyvemuseum, Ellerhammers Alle, Denmark. PL344 : IXe : (N344TB) wears 253Sqn/TL-B : AW Easton, Maryland. 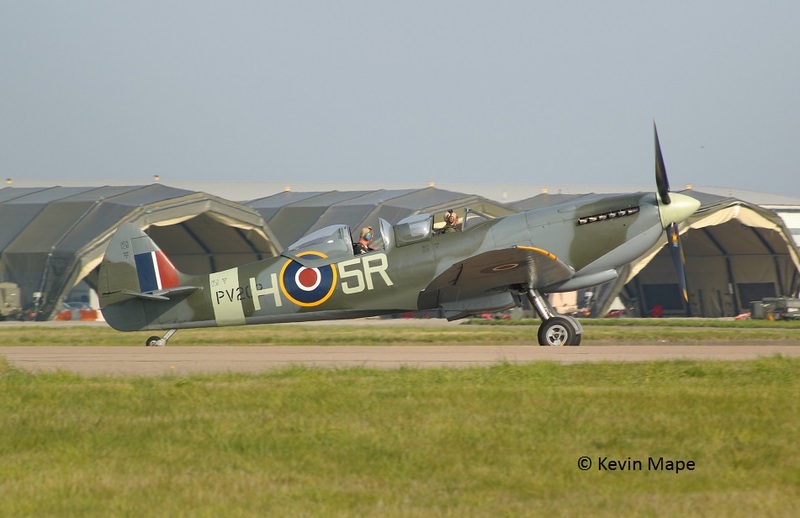 Taken at RIAT 2010. Ex G-IXCC. PT462 : TR 9 : (G-CTIX) : Wears SW-A : Aw Bryngwyn Bach, Clwyd UK. 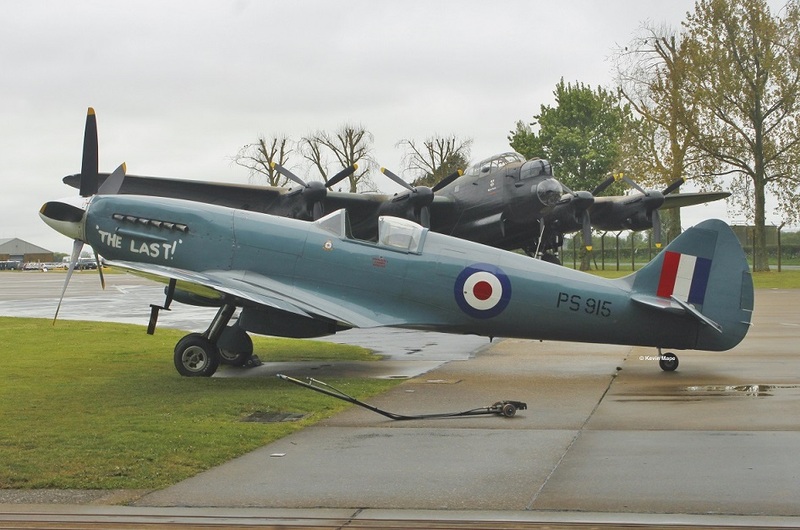 PT879 : F IX : (G-BYDE) : Restoration to Aw condition : North Weald UK. PV202 : TR9 : (G-CCCA) Wore H-98 Royal Netherlands Air Force : Aw RAF Coningsby April 2007. PV202 : TR 9 : (G-CCCA) Wore 19Sqn/QO-I : Aw Duxford UK. 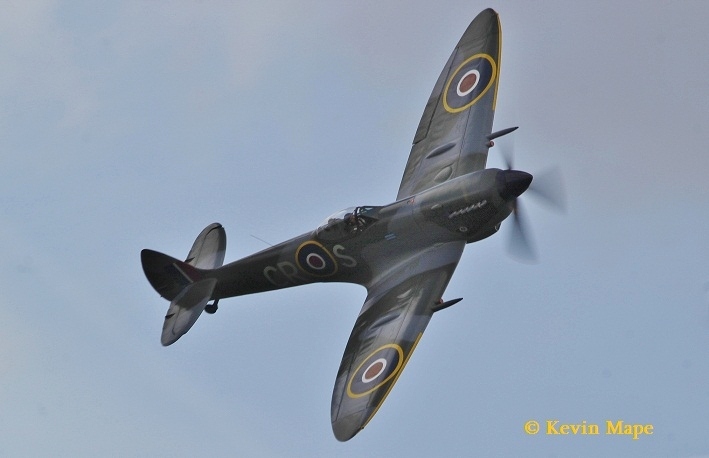 Taken at RIAT 2010. PV202 : TR9 : (G-CCCA) Wears 33Sqn/5R-H : Aw Duxford UK. 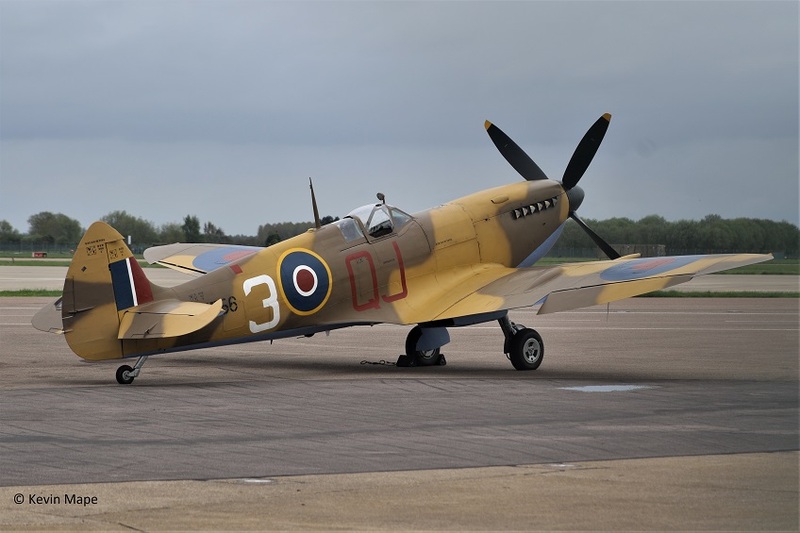 Taken at RAF Coningsby Oct 2015. PV270 : IXc : (ZK-SPI) : Wears marks of Air Com Alan AL Deere /AL Aw based at RNZAF Base Ohakea New Zealand. RR232 : HF IXf : (G-BRSF) Aw based at Colerne UK. SL633 : IXe : (N633VS) : Wears Czech AF marks 4th AR/JT-10 : Aw Paine Field, Washington USA – Taken RIAT 2015. 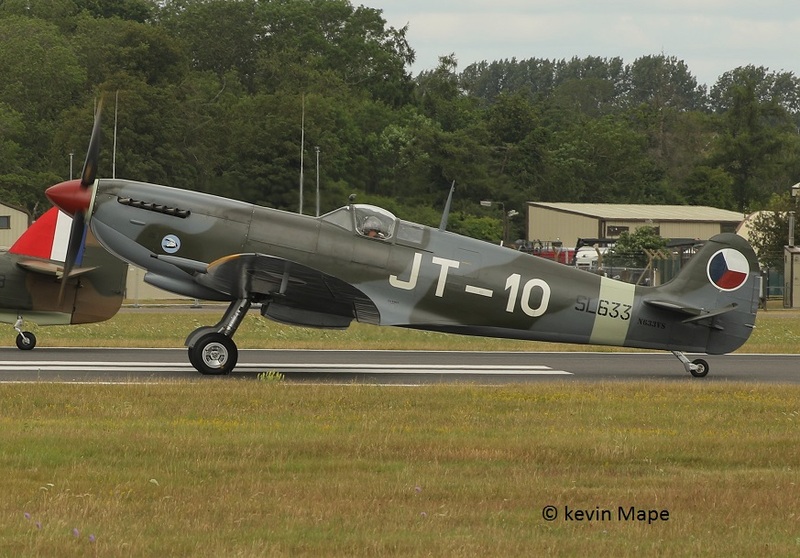 SM520 : Tr 9 : (G-ILDA) : Wears KJ-I : 16Sqn : Aw Goodwood UK. Taken at RIAT 2015. SM639 : LF IXe : Stored in the Godalming area Surrey . UK. TA805 : HF IX : (G-PMNF) Wears 234Sqn/FX-M : Aw Biggin Hill. UK. 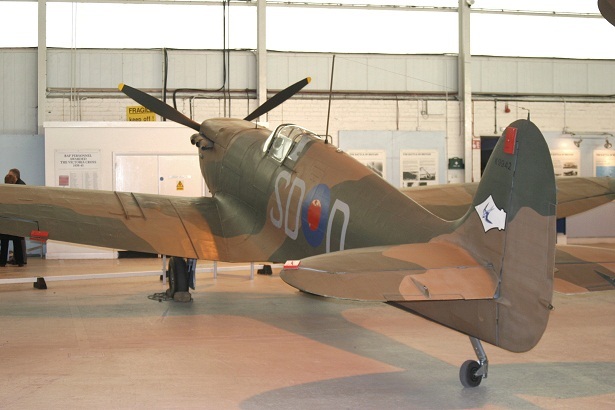 TE213 : HF IXe : Wears SAAF 5518 : Awaiting restoration to static condition – SAAF Museum AFB Swartkop . 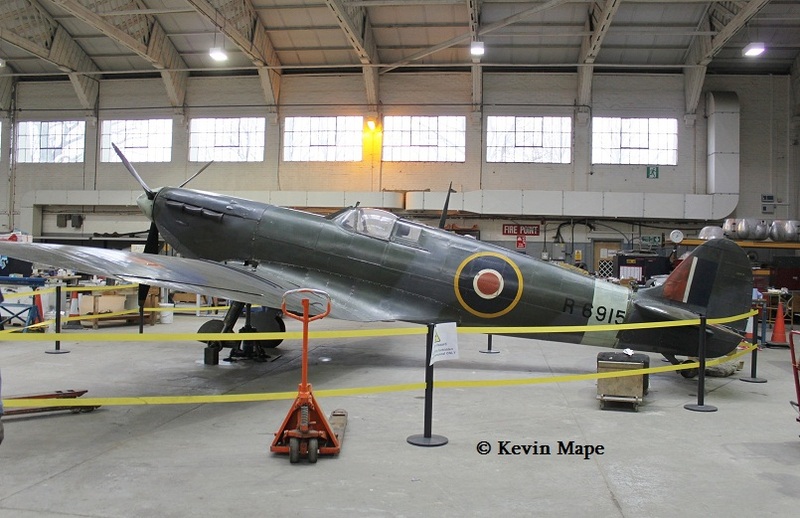 TE294 : HF IXe : Wears 442Sqn/Y2-K : Under restoration to Aw at Gatineau, Quebec Canada. TE308 : TR9 : Wears RJ-M – Restoration Fort Collins TX USA. TE517 : IXe : Wears Bermese AF marks UB-421 : Displayed at the Defence Services Museum Naypyidaw Myanmar. TE527 : IXe : UB431 : Rear Fuselage and tail section : Displayed at Defence Services Museum Naypyidaw Myanmar. TE554 : LF IXe : Wears IDF 20-57 : Aw Based at Israeli Air Force Museum in Hatzerim Isreal. TE565 : LF IXe : Wears 310(Czech)Sqn/NN-N : Displayed at the National Technical Museum Prague Czech Republic. TE566 : LF IXe : (VH- IXT) : stored at Cotswold Airport. UK. TE578 : LF IXe : Wears IDF 20-28 : Displayed at Israeli Air Force Museum Hatzerim Isreal . PL979 : PR XI : Wears AZ-B Royal Norwegian A/F marks : Displayed Gardermoen, Oslo Norway. 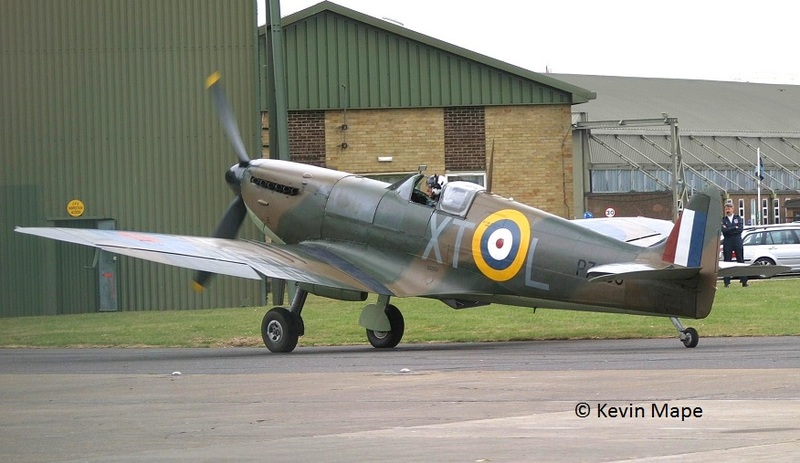 PL965 : PR XI : (G-MKXI) Wears PR Blue /R : Aw North Weald. UK. MT847 : FR.XIVe : Wears XA-H : Pictured at MOSI Manchester now . 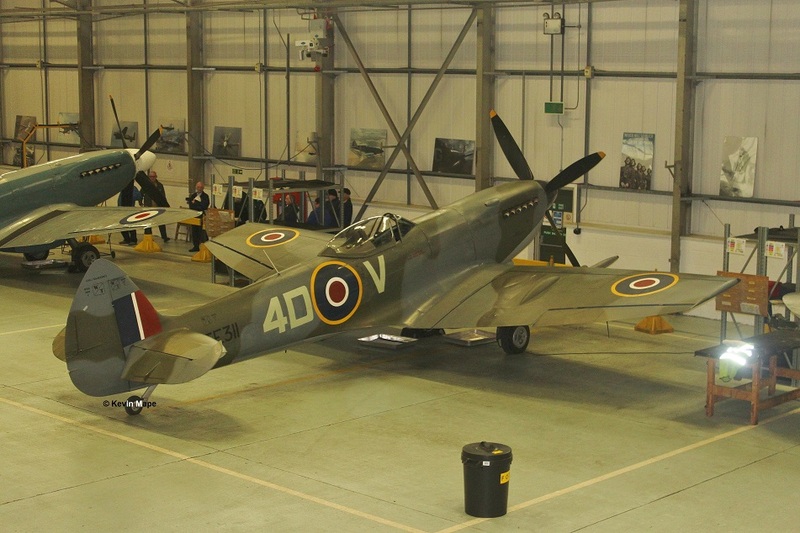 – Displayed at RAF Museum Hendon UK. MV262 : FR XIVe :(N808U) Stored Fantasy of Flight – Polk City Fl USA. MV293 : FR XIV : (G-SPIT) Wears MV268/JE-J – Taken at Duxford July 2007. MV293 : FR XIV : (G-SPIT) Wears MV268/JE-J : Aw Duxford UK. Photo May 2011. MV370 : FR XIVc : Wears 41Sqn/EB-Q : Displayed Aviation museum Hannover Germany. NH749 : FR XIVe : (N749DP) ex G-MXIV Wears SEAC / L marks : Aw Camarillo – Ventura County MAP USA. NH799 : LF XIV : (ZK-XIV) Wears SEAC / T : AW based at Omaka New Zealand. NH904 : FR XIVe : (N114BP) wears WZ-P – Displayed Air Museum Palm Springs Ca USA. RM689 : F XIV : Remains stored at East Midlands A/P UK. RM694 : F XIV : (G-DBKL) : Stored in Buckinghamshire UK. RM747 : F XIVe : In storage at Vintage Wings of Canada Gatineau, Quebec, Canada. RM921 : FR XIVe : SG-57. 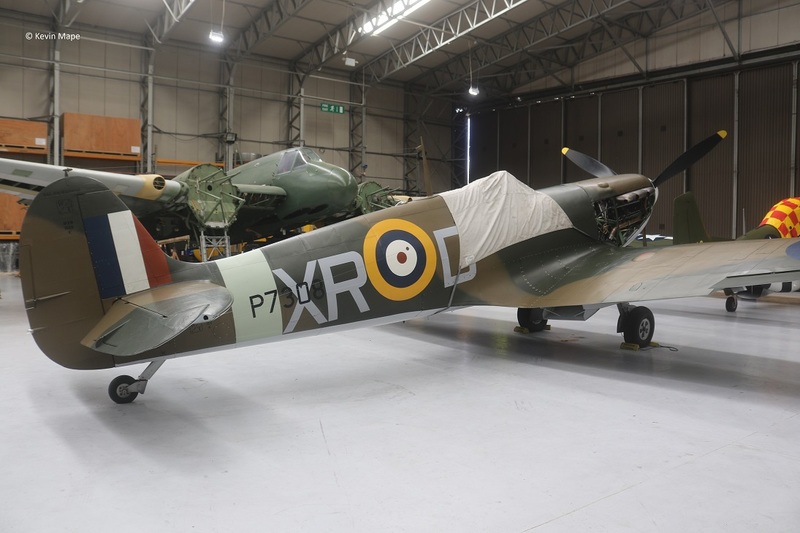 Wears 54Sqn/DL-E , Displayed at the Spitfire Museum in Florennes Air Force Base Belgium. RN201 : F XIV : (N201TB) : Aw wears 41Sqn Race marks – Silver with a red stripe -Based at Easton, Maryland USA. SM832 : F XIVe : (NX54SF) / Aw Wears 17Sqn/YB-A – Comanche Fighters, Texas. SM914 : FR XIVe : Wears Thai Air Force / KH14-1/93 Displayed at the Thai Air Force Museum Bangkok, Thailand. TZ138 : FR XVIe : (C-GSPT) Aw when put in storage at Vancouver International Airport BC Canada. RR263 : LF XVIe : Wears TB597 340(French)Sqn/GW-B : Displayed in Musee de la Air Museum Le Bourget. France. 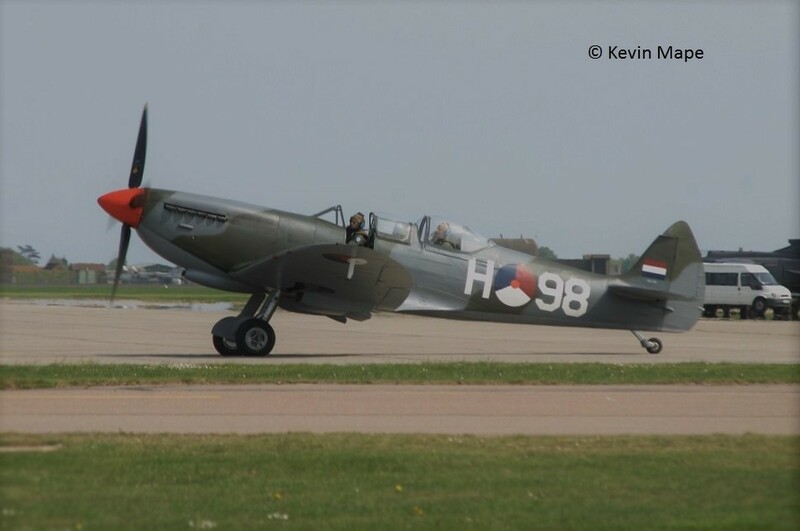 RW382 : XVI : ( G- PBIX ) : Wears 322(Dutch)Sqn/3W – P : Aw Biggen Hill UK. RW388 : LF XVIe : Wears 667Sqn/U4-U : Displayed at Hanley Stoke on Trent UK. RW393 : LF XVIe : Wears TB675 74Sqn/4D-V : Displayed RAFM Hendon UK. 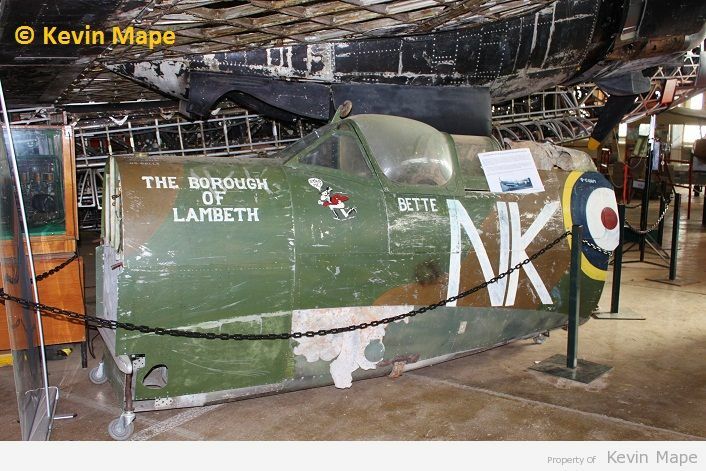 SL542 : F XVIe : (N2289J) : Under Restoration to Aw Condition Enstone UK. SL574 : LF XVIe : Wears DD-E – Displayed Air & Space Museum San Diego Ca USA. SL611 : LF XVIe : Remains stored RAFM store Stafford UK. SL674 : LF XVIe : Stored at RAFM store Stafford UK. SL721 : LF XVIe : (C-GVBZ) wears 421Sqn/AU-J RCAF : Aw Based Gatineau Quebec Canada. 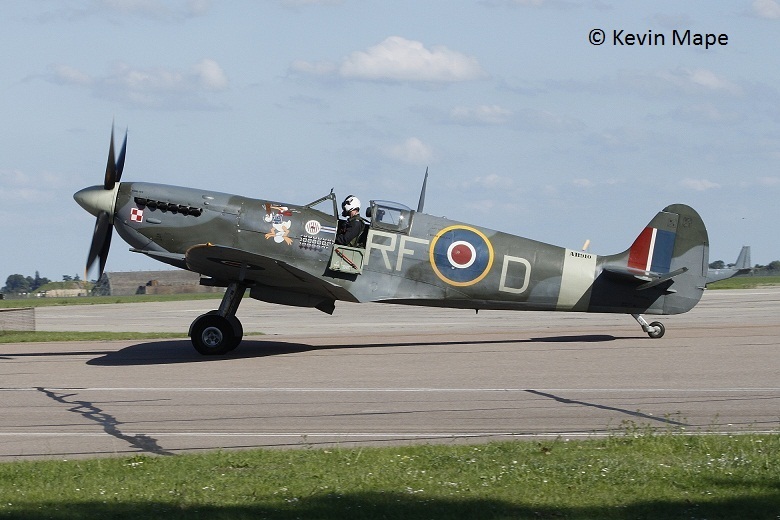 SM411 : LF XVIe : Wears TB995 308(Polish)Sqn/ZF-O : Displayed Polish Aviation Museum Poland. TB252 : LF XVIe : (N725TB) Stored Ardmore Airport, Auckland New Zealand. 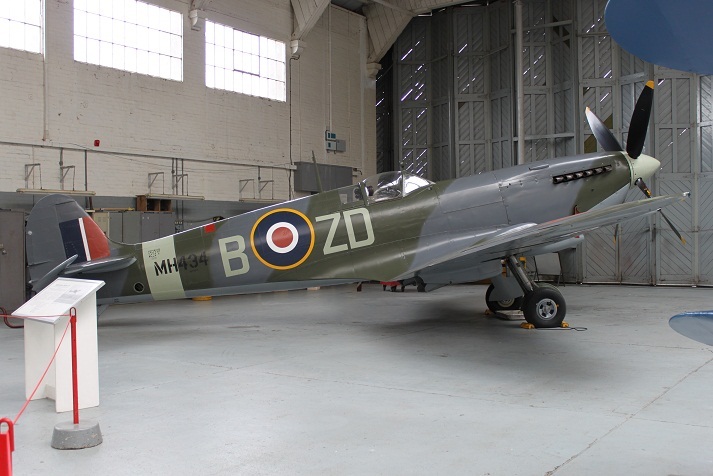 TB752 : LF XVIe : Wears 403(Wolf)Sqn/KH-Z : Displayed at Spitfire Museum Manston UK. TB863 : LF.XVIe : (VH-XVI) wears 453Sqn/FU-P Aw Temora NSW Australia. 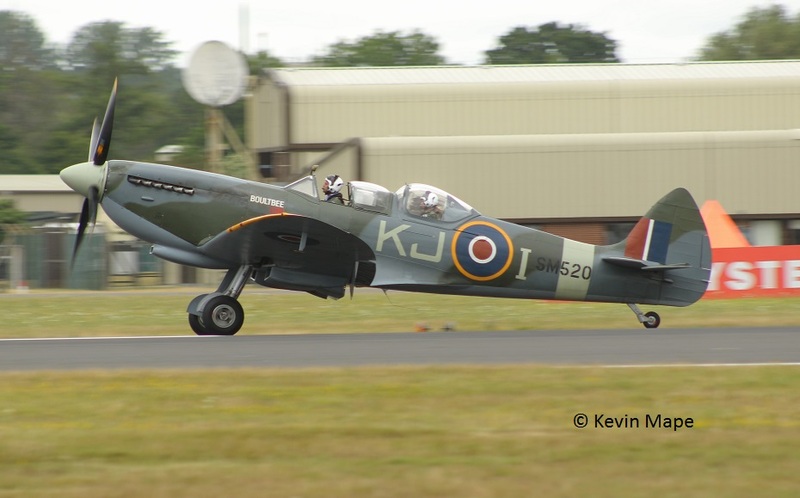 TB885 : LF XVIe : Restoration To Aw at Biggin Hill UK. TD135 : LF XVIe : Stored at Brasschat Belgium. TD248 : LF XVIe : (G-OXVI) wears 126Sqn/CR-S Aw Humberside Airport UK . 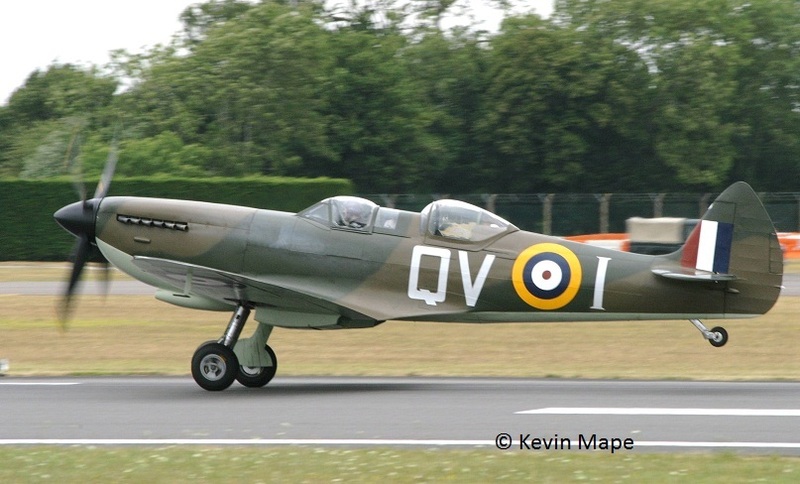 TE184 : LF XVIe : (G-MXVI) Wears 312(Czech)Sqn/DU-N : Aw Biggen Hill UK. TE214 : LF XVIe : Wears 416Sqn/DN-T : Displayed at the CWH Museum Mount Hope Ont Canada. 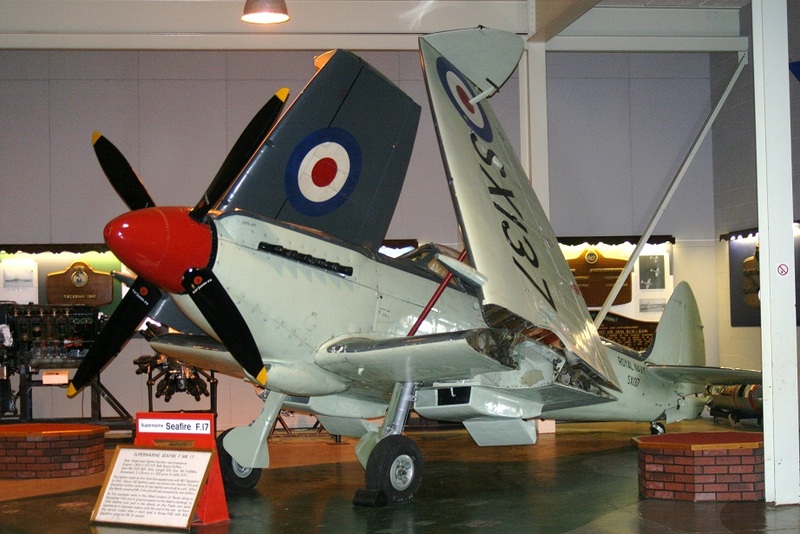 TE288 : LF XVIe : Wears 485Sqn/OU-V : Displayed at RNZAF Museum Wigram New Zealand. 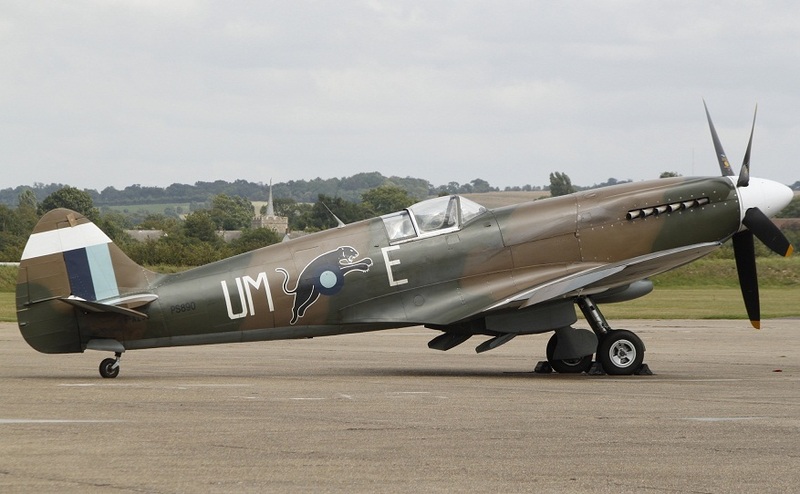 TE311 : LF XVIe : Wears 74 Sqn/4D-V : Aw RAF Coningsby UK : Wore Invasion Stripes for the 2015 season. TE311 : LF XVIe : Wears 131(Polish)Wing/SZ-G : RAF Coningsby UK April 2018. TE330 : LF XVIe : Wears 601Sqn/HT-B : Displayed ain the China Aviation Museum, Datangshan China. TE356 : LF XVIe : (N356TE) – Displayed Evergreen Aviation & Space museum McMinnville Or USA. TE384 : LF XVIe : (N384TE) wears ***Sqn/VI-X – Stored San Martin Ca USA. 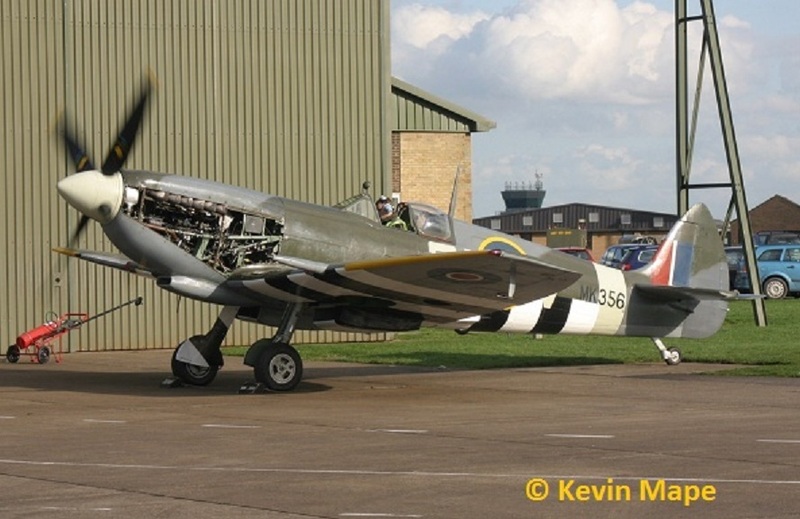 TE392 : LF XVIe : (N97RW) wears 145Sqn/ZX-Z – Stored Lone star Museum Galveston Tx USA. 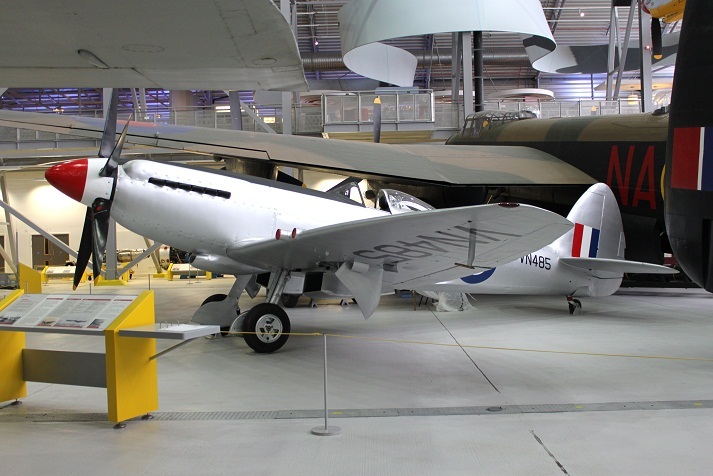 TE462 : LF XVIe : Displayed In the Museum of flight – East Fortune UK. TE476 : LF XVIe : (N476TE) wears 349(Bel)Sqn/GE-D – Under restoration Fantasy of Flt Polk City Fl USA. SM845 : XVIIIe : Wearing 32Sqn/GZ-J Taken at Duxford July 2007. 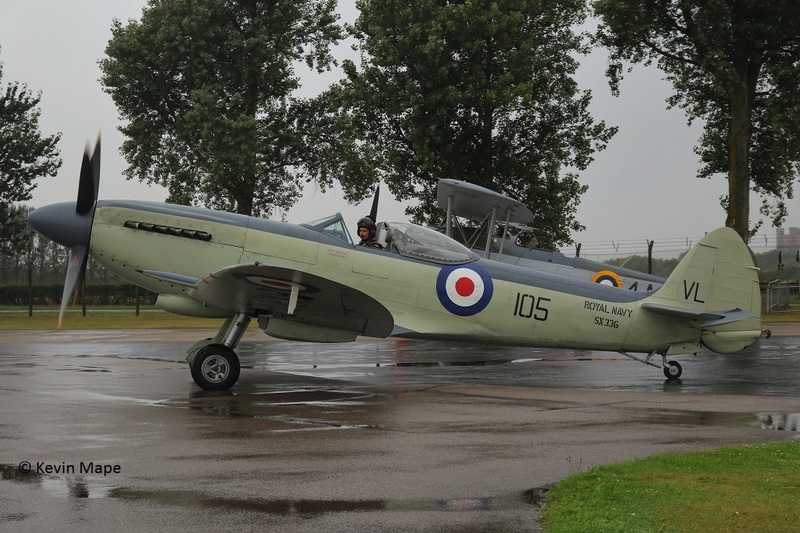 SM845 : XVIIIe : Wears 80Sqn/R marks – AW Humberside Airport UK. 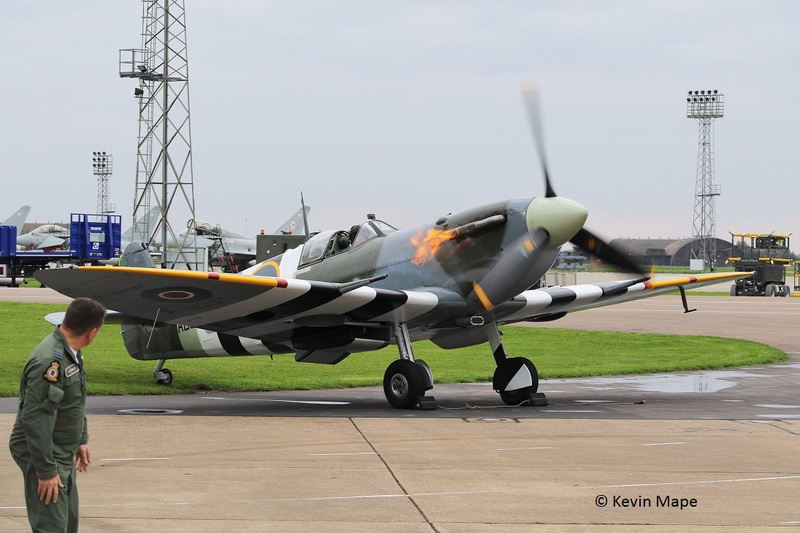 Taken – Coningsby October 2015. SM969 : F XVIII : (N969SM) Wears 28Sqn/S Koreon War Stripes : Aw Bentonville, Arkansas. SM986 : F XVIIIe : Wears IAF HS986 ; Displayed at Indian Air Force Museum, Palam New Delhi India. TP276 : FR XVIIIe : Stored at the Frasca Air Museum Urbana Il USA – ex Indian Air Force HS653. TP280 : FR XVIIIe : (D-FSPT) Wears 60Sqn/T Aw at Meier Motors, Eschbach, Germany. TP298 : XVIII : (N41702) : Stored Sandown I.O.W. UK. TP367 :F XVIII : IAF HS669 Stored Kent UK. PM627 : PR XIX : Wears RSwAF F11 -51/51 : Displayed Flygvapenmuseum, Linköping Sweden. ex IAF HS694. PM630 : PR XIX : Thai Air Force : Stored Bangkok, Thailand. PM631 : PR XIX : stored RAF Coningsby Sept 2016 awaiting an engine . 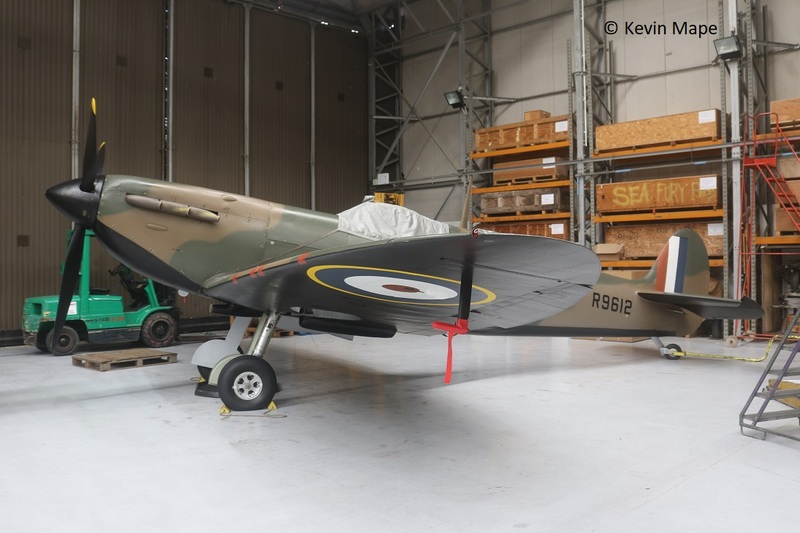 PM651 : PR XIX : Stored at RAF Stafford – Photo when stored at Cosford. PS836 : PR XIX : Thai Air Force : Stored Bangkok, Thailand. PS853 : PR XIX : (G-RRGN) wears C /16Sqn AW Filton UK. PS890 :PR.XIX : (F-AZJS) wears 152Sqn/UM-E AW Dijon France. PS915 : PR.XIXe : 81Sqn marks : AW RAF Coningsby UK. – Aug 2014. PS915 : PR XIXe : 80Sqn marks : AW RAF Coningsby UK Taken Sept 2016. LA198 : F 21 : Wears RAI- G : Displayed at Kelvingrove Art Gallery & Museum , Glasgow. UK. LA226 : F21 : Stored in the RAF Museum Store Stafford. UK. LA255 : F21 : Wears 1Sqn/JX-U : Preserved with 1(F)Sqn at RAF Lossiemouth. UK. PK355 : F 22 : Displayed at the Gweru Military Museum, Gweru, Zimbabwe. PK481 : F 22 : Displayed at RAAF Museum – Bull Creek, WA, Australia. PK624 : F 22 : Fuselage stored at Duxford. UK. PK664 : F22 : Stored at North Weald. UK. PK915 : F22 : ( G-SPXX) Restoration project stored in Buckinghamshire. UK. 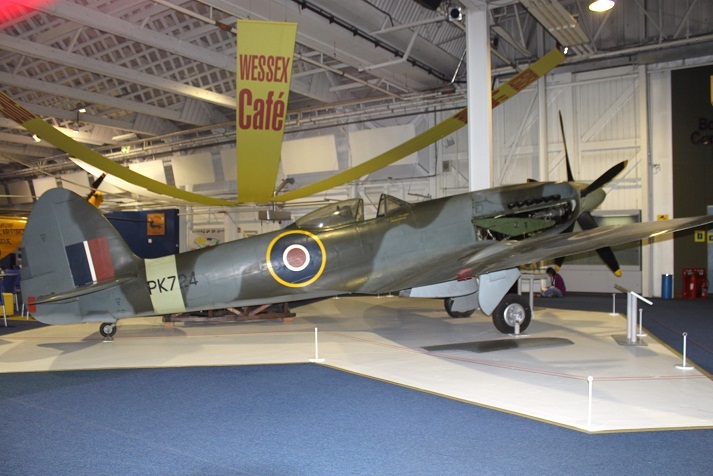 PK683 : F 24 : Displayed at Solent Wings Museum Southampton UK. 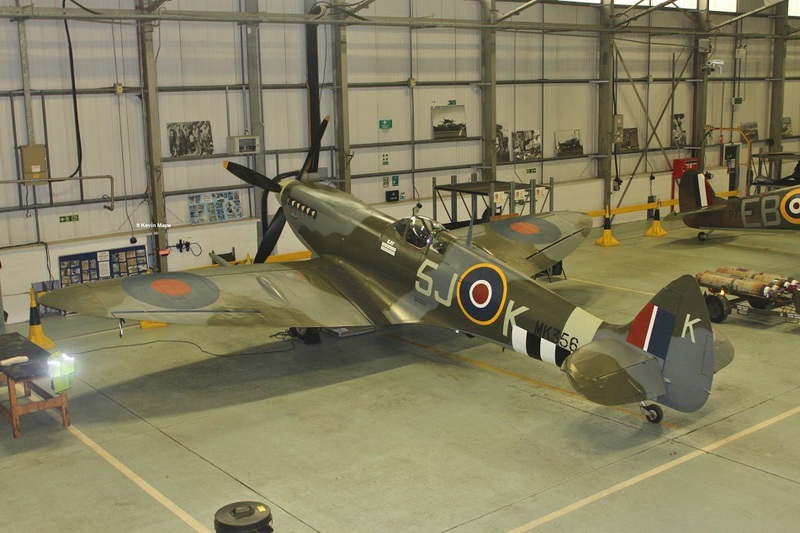 PK724 : F 24 : Displayed at the RAF Museum Hendon UK. VN485 :F 24 :80Sqn : Displayed at Imperial War Museum Duxford UK. 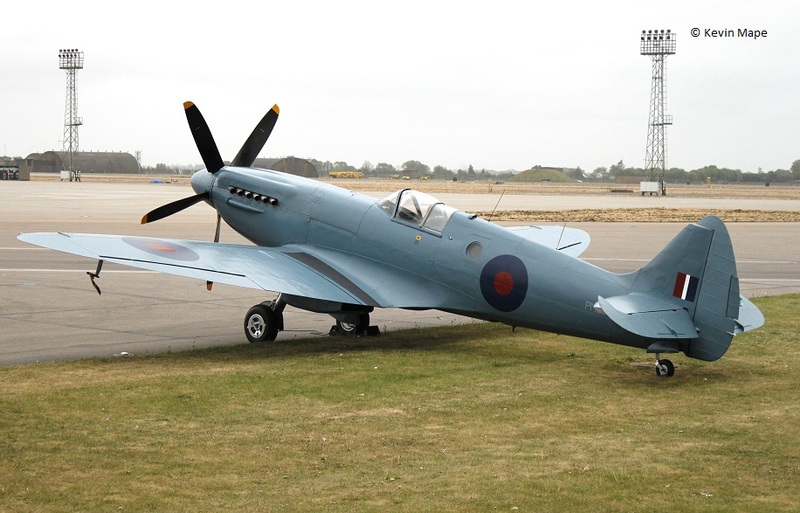 The Navy version of the Spitfire was called Seafire, Sixteen Seafire are known to survive around the World. 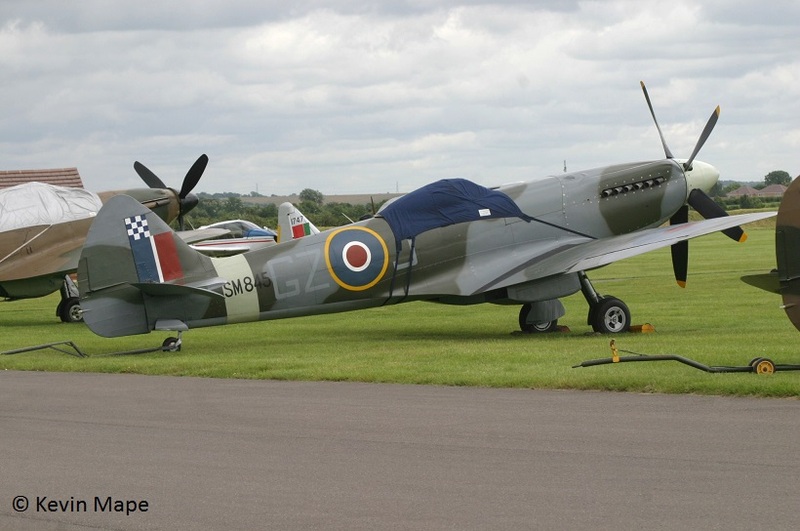 MB293 : IIc : (G-CFGI) Stored at Duxford UK. 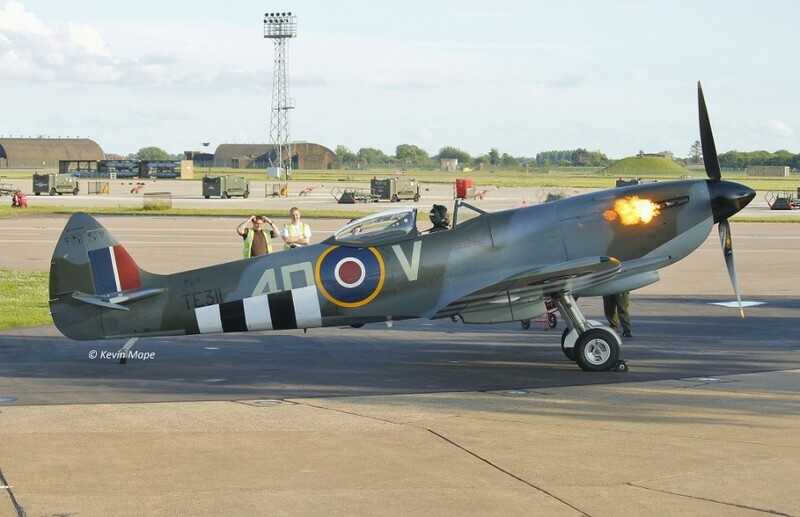 PP972 : LF IIIC : (G-BUAR) Wears N-11-5 : 880NAS : Aw Sywell UK. 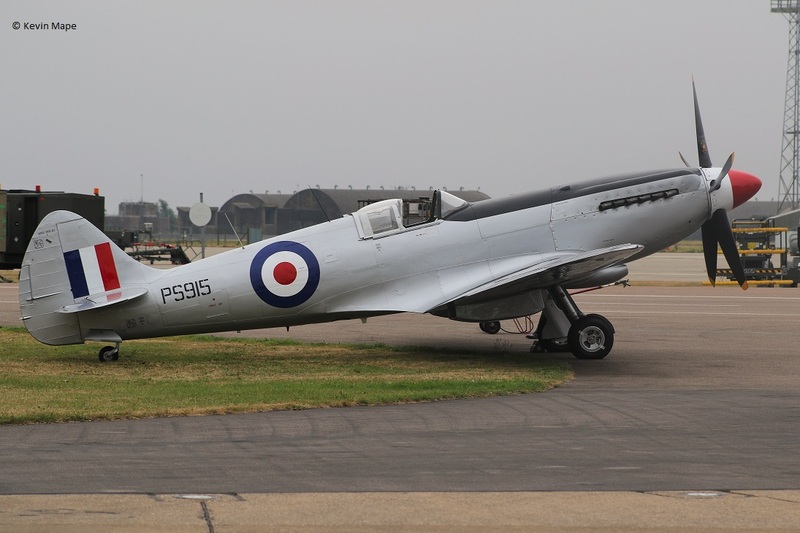 RX168 : L IIIc : (G-BWEM) stored Duxford UK. PR376 : F XV wears UB409 : Displayed Rangoon Myanmar. PR422 : F XV :(N462XV) Restoration at Columbia Missouri USA. 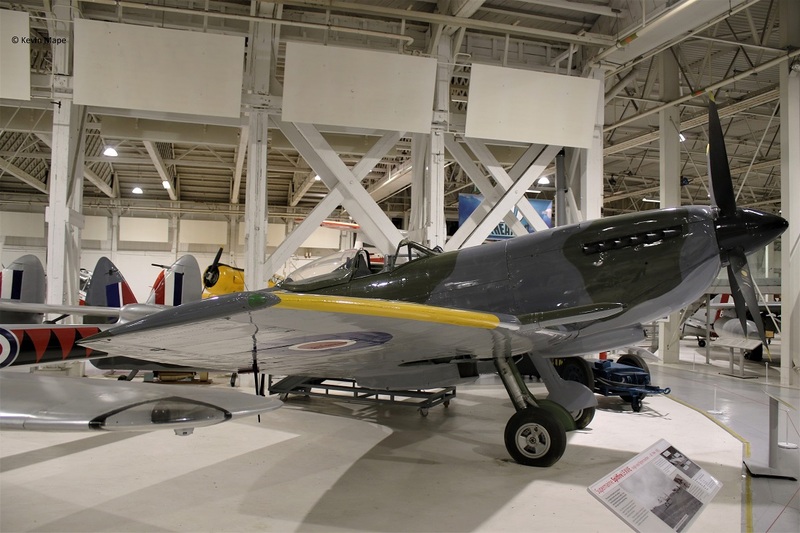 PR451 : F XVc : wears RCN VG AA-N :Displayed at Naval Air Museum Alberta Canada. PR503 : F XV :(C-GCWK) wears 803Sqn/K RCN – Stored Columbia Missouri USA. SR462 : F XV : (G-TGVP) – Under restoration North Weald UK. SW800 : F XV :(VH-CIH) Stored Melbourne Australia. SX137 : F XVII : Displayed at FAA Museum Yeovilton UK. 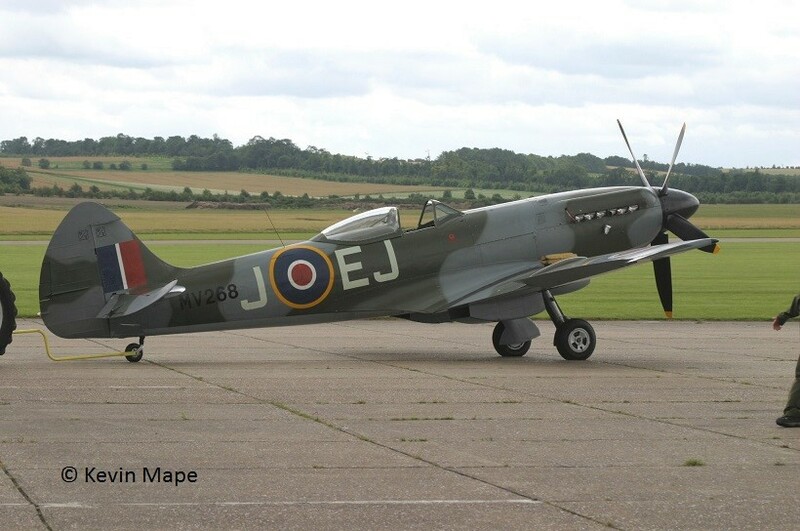 SX300 : XVII : (G-CDTM) Under restoration to Aw condition North Weald UK. SX336 : XVII : (G-KASX) Wears VL-105 : Aw North Weald UK. LA546 : F46 :(G-CFZJ) Stored Great Horksley Essex UK. LA564 : F46 :(G-FRSX) Restoration North Weald UK . VP441 : FR 47 : (N47SF) wears O-139 804NAS Stored Montana USA.